Discover how your small business compares to your industry & local area. 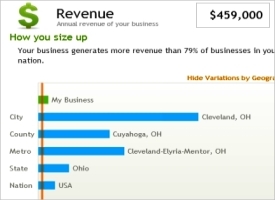 Compare by revenue size, business age, or salary levels. Target your marketing. Map out which locales have the highest household income or businesses with the highest revenues. Get started! Research your business – use the interactive tool below. Have you ever wondered, “How does my business compare?” If so, this free competitive intelligence tool can help you research your business. For example, it helps small businesses compare how they are doing against competitors in their local town, city, state or region, or nationally. It also helps small businesses compare their business to the age of other businesses in their industry. They can also compare worker salary levels. Need help with new business development? 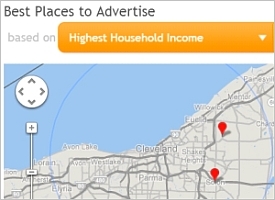 This tool can identify geographical areas to reach your target market. Identify the best cities and neighborhoods in which to advertise or send direct mail to reach business and consumer prospects. Why waste time sending mailers to households or places of business, if the recipients lack sufficient income to buy your products or services? You’ll save money and avoid wasted effort. For background, read: How Marketing Research Can Benefit A Small Business.